Object is excited to announce that the Australian Design Alliance has come on board as an Industry Partner for our creative program CUSP: Designing for the Next Decade. As part of this partnership, AdA Executive Director Lisa Cahill joined the Object team for a day planning marketing and communication ideas for the program. 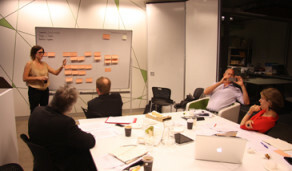 Last week I joined 10 people from the fabulous Object team to design a marketing strategy for their new project. CUSP: Designing for the Next Decade kicks off in Sydney in March 2013. It will involve 12 amazing Australian designers doing groundbreaking work towards evolving a better future for us all. I’m there because the Australian Design Alliance is a partner on CUSP and Object is one of our valued associate members. The great thing about being part of this project is that Object takes design thinking into every aspect of the work they do. Everyone at Object is involved in making this project happen — marketing, admin and curatorial staff, producers, the General Manager and Director all contributed. Some really exciting ideas were developed to bring the CUSP experience to everyone including the design community, children, families, partners, business. Everyone at Object will be living and breathing CUSP over the next two years. And I will be too! It’s a privilege to be involved in such an exciting project and know that what we are doing has a real possibility of making our lives better in so may ways. Taking a lead from the CUSP designers we’ll have the tools to design creative solutions for ourselves. More information and exciting news about CUSP: Designing for the Next Decade will be available shortly on this website — stay tuned!